It is about healthy eating, but it is also about variety, moderation and balance and it is about FUN. 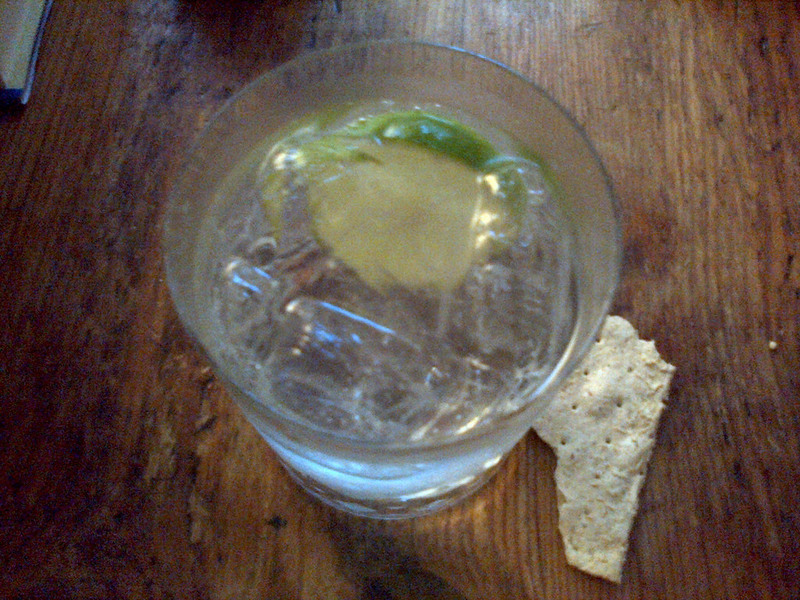 A gin and tonic can be part of healthy eating…lots of G&T’s possibly not ! On friday’s husband and I gather at my parents for a chat and occasionally some food or a film (Spider had a thing about James Bond this year and we ended up working out way through most of the films on fridays). My Dad and I indulge in a G&T, well usually 2 G&T’s. Some time ago we decided to start trying and comparing Gin’s and over the next few weeks I will try and tell you about them…if I start writing down what we thought about each brand then I can at least pretend we are connoisseur and not alcoholics ! There is however no such thing as a perfect G&T as it’s all a matter of personal taste, however what follows is how we make our G&T’s and it is how we have tested each of the various brands we have tried so far. Take a cut glass tumbler…you can use any old glass but I think the drinking experience is so much nicer when you drink out of good glass…besides we used to use the markings on ours to measure out the gin…these days we use a proper measure ! Add a slice of lime… in most pubs in the UK you tend to get lemon…our family has just always preferred lime, so lime it is. If it’s not a naturally juicy one then give it a quick squeeze to help it out…alternatively rub the lime round the top of the glass. Measure out 50ml of gin… as I mentioned we used to pour the gin to a particular point in the glass but about 3 years ago decided to act like responsible adults. We use a measure that came as a lid to a bottle of tonic once, it was approximately the same amount of gin as the mark on the glass method…much much later one of us poured the measure into a measuring glass and worked out that our G&T’s were based on a double measure ! I have had a love affair with sweetcorn for a long long time. At the age of 7 if asked, I would answer that my favourite food was chicken and sweetcorn soup, but I think it was probably the sweetcorn part that made the difference. It is also one of the few vegetables that I can get Spider to eat without fuss which is why if a couple of cobs of sweetcorn appear in the weekly veg box, they usually end up heading his way instead of mine…but, because Husband, doesn’t eat it, it is not something that I generally end up buying…not even tinned. I have been meaning to give the blog a facelift for sometime…in fact I started to do so at the beginning of the year, but then caught the flu and for quite some time have had no real interest in food… But then it is difficult to sustain an interest in food when you are bombarded by media messages about how the developed world is heading for an obesity crisis and that we are all eating such bad bad things ! I don’t believe in diets though, or rather “dieting”. You follow a diet for a set time, loose weight and then go back to how you used to be, and the weight just all comes back…I also don’t believe in “good” and “bad” foods. Food is a source of energy, if you eat it you will live, however some foods you can eat more of without an adverse effect on your weight and some foods are probably best kept for treats ! (Supersize me demonstrates that quite well !). I also don’t believe in daily calorie limits…I don’t believe in beating yourself up on Monday because you pushed the boat out on Sunday…As long as what you eat is on average healthy and not heavily laden with fat and sugar then the occasional G&T is not a reason for abandoning any attempt at healthy living as doomed from the start! So the direction I’m going in is a slow and gentle tweaking of what the household eats. A long time ago I used to date lawyers, I remember one in particular who used to do a lot of sport in his teenage and student years, who proudly showed me his only piece of cooking equipment, a liquidiser. The liquidiser’s role was to help him produce his favourite after exercise drink the recipe for which he shared with me as comprising 2 large tablespoons of Nutella, 2 scopes ice cream, topped up with full cream milk. Technically I guess the ice cream made it a shake rather than a smoothie. But smoothie or shake the exercise drink when taken regularly without the addition of exercise (and this lawyer had no time for exercise in between working and commuting) lead to a severe piling on of the poundage ! Smoothies can play a part of a healthy diet. The fruit admittedly has a high sugar content but the smoothie can be kept low fat depending on what dairy products you choose to add. Skimmed milk and ice cubes would be a better low fat option than full cream milk and ice cream. At 2am in the morning however, with a limited range of ingredients and, due to the flu, not having eaten much food at all over the past 11 days, I was just looking for something that filled the hole in my tummy although part of me was thinking vaguely of the need to keep my strength up. Place 2 tablespoons peanut butter, 1-2 bananas in a liquidiser add a glass of milk. Blitz in liquidiser for 2 minutes or until smooth…add more milk if drink too thick. Later in the day I made another one as an afternoon snack. This one was more weight conscious in that it consisted mainly of apples and bananas and no peanut butter…on reflection though I’d probably been better off replacing the milk with orange juice as the apples made the smoothie very fluffy ! No photos…it was 2am and I was very very hungry ! This is the start to chapter 4 of Delia How to Cook, Book 2 which is where I decided to start, because there was a chicken in the fridge and becasue it is February and I find February a hard month to get through and Delia is right, a chicken roasting in the oven (especially one with a lemon up its bum) just makes the day feel a little bit more golden. But it works, it does, bang on 45 minutes the chicken came out and it was done perfectly…and the gravy was spot on and we were all happy and feeling that little bit more spring like…and there were leftovers (2 stir fries and a chicken sandwich).